World War II is raging, and the Nazis are in need of an edge for victory. They turn to the dark arts, and the power of an enigmatic mystic. While enlisted with Britain’s Military Intelligence, Trevor Bruttenholm discovers a series of strange messages, believing he’s stumbled upon an occult language. Trusting his gut, he starts to hunt for the source, encountering deadly occultists, evil Nazi agents, and vile undead creatures along the way. His journey leads him to a face off with one of the evilest men to walk among us. Rasputin lives … and his strange sorcery will bring Hellboy to Earth! Mike Mignola’s Hellboy universe is ripe with his own take on occult mythology infused with original characters that consistently take our breath away. Collecting all five issues of his Rasputin mini-series, we now get a prequel of the Hellboy origin story in one glorious shot. With art by Dave Stewart and Christopher Mitten, Prof. Bruttenholm heads off on the hunt for the mysterious Rasputin, determined to stop him in his tracks no matter the cost. 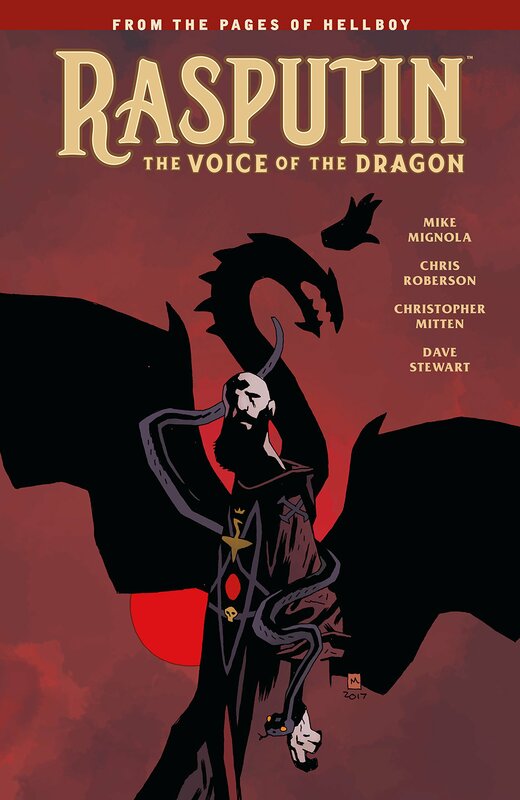 Coming 7 August 2018 from Darkhorse Comics, Rasputin: The Voice of the Dragon, will be available through Comixology and your local comic book store. Pre-order your copy today.